This brave orange can't live without traveling and adventures! This time he decided to go to the Wild West. But he didn't expect that the dangerous cloud will follow him again. Now you must cover the orange with something in order that he was safe. The metal rain will soon begin, so be careful in this free arcade game. Are you ready to help the orange one more time? 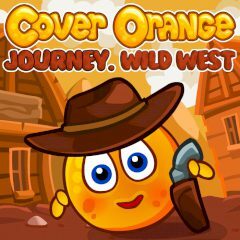 Now he is in the Wild West and needs a cover – otherwise the oncoming heavy rain will turn him into a bunch of rot. Do not waste your time anymore and start completing your task in this arcade game. You must build some simple fortifications in this puzzle game and not let the orange become rotten under the rain. Have fun with this game brought to you by BigDino!